There are five immunoglobulin classes (isotypes) of antibody molecules found in serum: IgG, IgM, IgA, IgE and IgD. They are distinguished by the type of heavy chain they contain. IgG molecules possess heavy chains known as γ-chains; IgMs have μ-chains; IgAs have α-chains; IgEs have ε-chains; and IgDs have δ-chains. The variation in heavy chain polypeptides allows each immunoglobulin class to function in a different type of immune response or during a different stage of the body’s defense. The amino acid sequences that confer these functional differences are located mainly within the Fc domain. Antibody classes also differ in their valency, i.e. the number of arms available to bind antigen. This arises from the ability of certain immunoglobulins to form multimers through linkage of their Fc domains via a J chain. For example, IgM is a pentamer of five identical “Y” shaped monomers. Therefore, the complete IgM protein contains 10 heavy chains, 10 light chains and 10 antigen binding arms (giving IgM a valency of 10). In humans, there are only two kinds of light chains – κ and λ (based on subtle amino acid differences in the VL and CL regions). The κ and λ chains are found 67% and 33% of the time, respectively. Any antibody can be formed by the association of one heavy chain type with one light chain type. In every possible combination there will be two identical heavy and light chains in the antibody unit (monomer). Hence the IgM pentamer can either comprise (μ2κ2)5 or (μ2λ2)5. Immunoglobulins are further broken down into four subclasses designated IgG1, IgG2, IgG3 and IgG4 (listed in decreasing order of abundance in the serum). They share more than 95% sequence homology in the CH regions of the γ-heavy chains. There are also two subclasses of IgA: IgA1 (90%) and IgA2 (10%). Serum IgA is a monomer but is found in secretions such as tears, mucous and saliva as a dimer. In secretions, IgA has a J chain and another protein called the secretory piece (or T piece) associated with it. In addition, several subclasses of κ and λ light chains are known to exist (1) . HuCAL is one of the most powerful methods available for producing human antibodies for research, diagnostic, and therapeutic use. 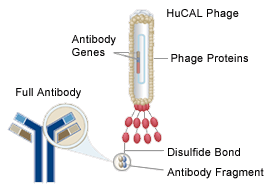 HuCAL stands for Human Combinatorial Antibody Library, a unique synthetic collection containing billions of recombinant human Fab antibodies which encompass the human antibody repertoire. Find out more about HuCAL and why HuCAL technology represents the cutting edge of monoclonal antibody generation.